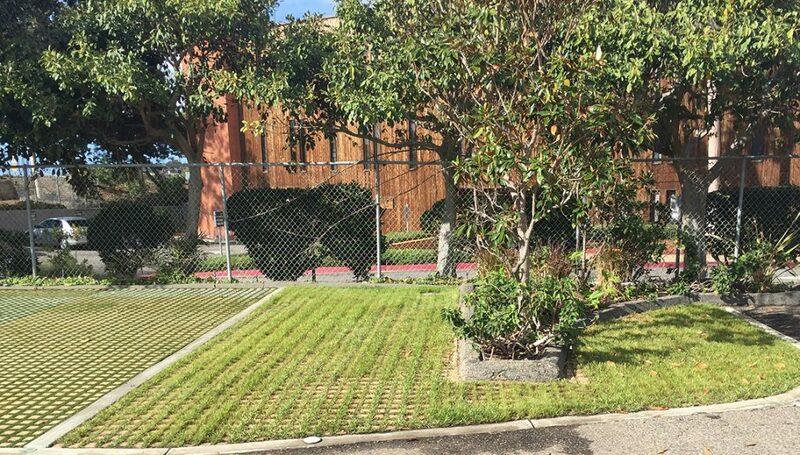 Drivable Grass® has originally been designed with the intention to have commonly used spray irrigation systems installed underneath the product, including fitting sprinkler heads through cut voids of the mat or spraying from outside the installation. The conventional overspray irrigation system has been used successfully with Drivable Grass® for many years. 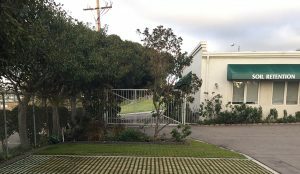 Soil Retention, manufacturer of Drivable Grass®, recently worked together with a leader in drip irrigation systems, Netafim USA, to prove alternatives in efforts to conserve water. 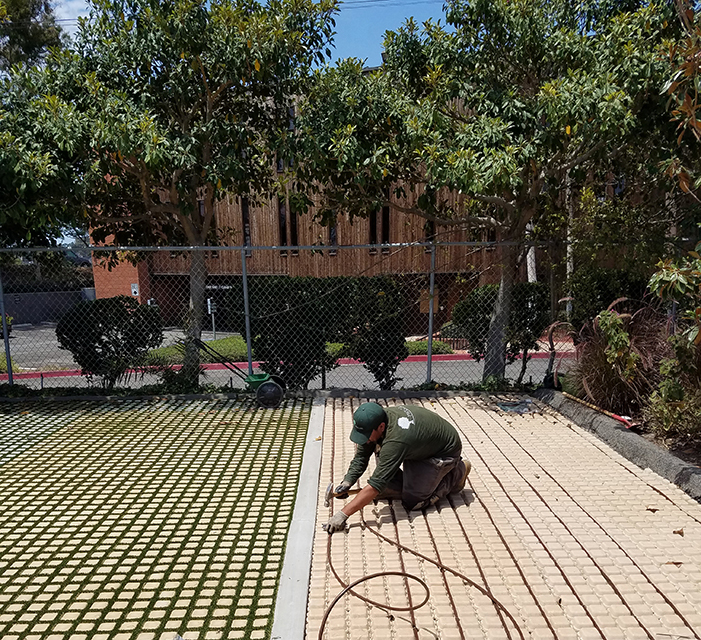 Netafim USA Techline® EZ dripline with 6” emitter spacing turned out to be a perfect fit and was installed in the summer of 2016 in our Carlsbad, CA coorporate office parking lot as a test site. Drip irrigation is generally more efficient than conventional sprinkler systems because they deliver low volumes of water directly to the plant roots, minimizing losses to wind, runoff evaporation, or overspray. Drip irrigation uses 20-50% less water than pop-up sprinklers. The unique design, limited thickness, and typical 2” thick bedding course below Drivable Grass® make drip irrigation ideal due to controlled delivery of water right to the root zone / bedding course. 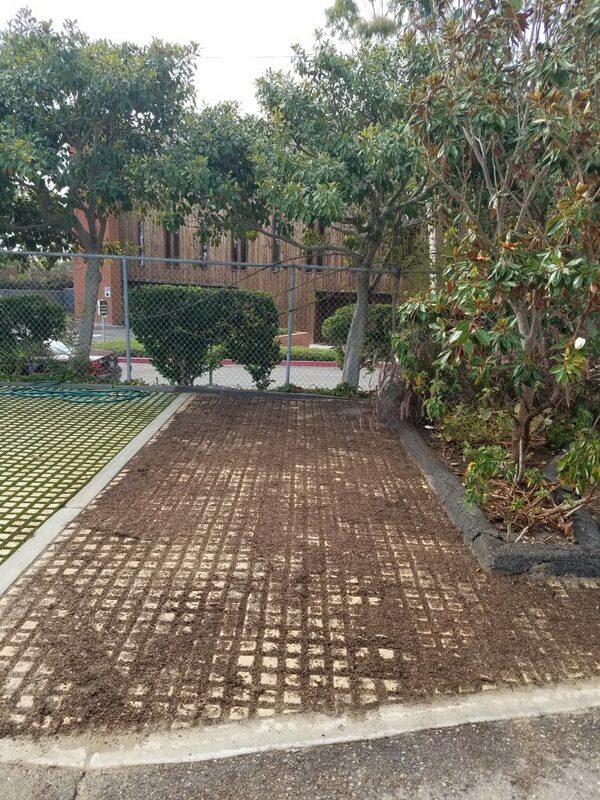 Installed were 300 linear feet of Techline® EZ dripline with 6” emitter spacing turned into 8 inch row spacing in the crevices/grooves of the Drivable Grass®, for a coverage area of 200 SF. To allow for obstructions and curves, different fittings were used. 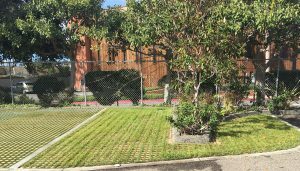 Once the drip irrigation system was secured in place with landscape staples, the Drivable Grass® was infilled with a mixture of 75/25 sand (ASTM-C33)/compost (Kellogg fine ground compost) and then seeded with a 70% fescue and 30% bent grass mixture. 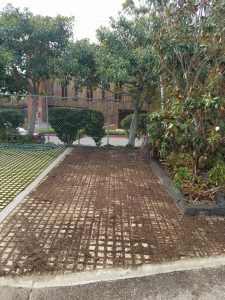 This grass blend is considered a California drought tolerant mix. To ensure the seed was kept moist, a seed topper was used to lightly cover the installation and some overspray was used. The parking lot test site area is used on a daily basis at Soil Retention’s headquarter office in Carlsbad, CA. After six months, the drip irrigation has proven to be a great success saving water and money. 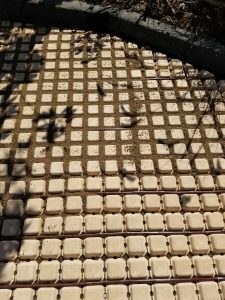 Drivable Grass® is the premiere permeable, flexible and plantable concrete pavement system. 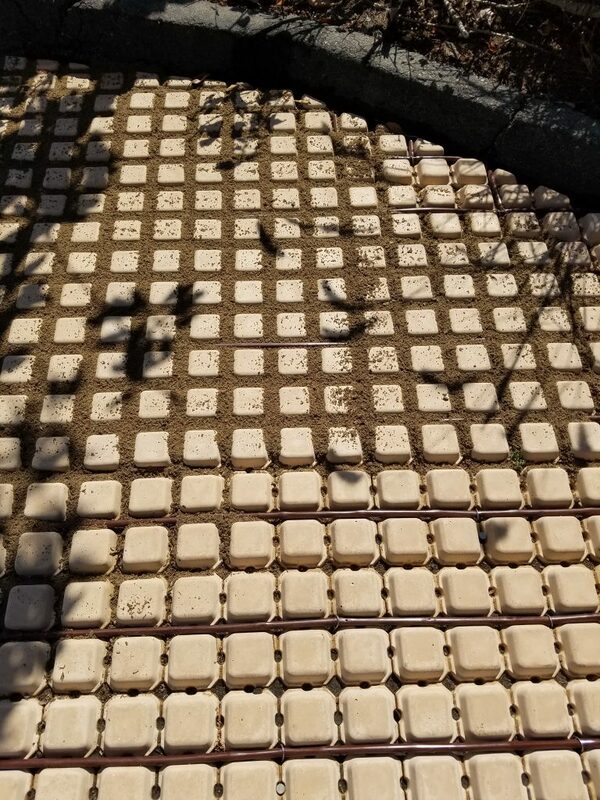 It is an ideal solution for daily driving applications; it is plantable with void spaces that prohibit compaction within the root zone, offering an environmentally-friendly option without sacrificing beautiful green space.